I've decided for this week to highlight a different branch of my family tree. This ancestor is from Jones family line. 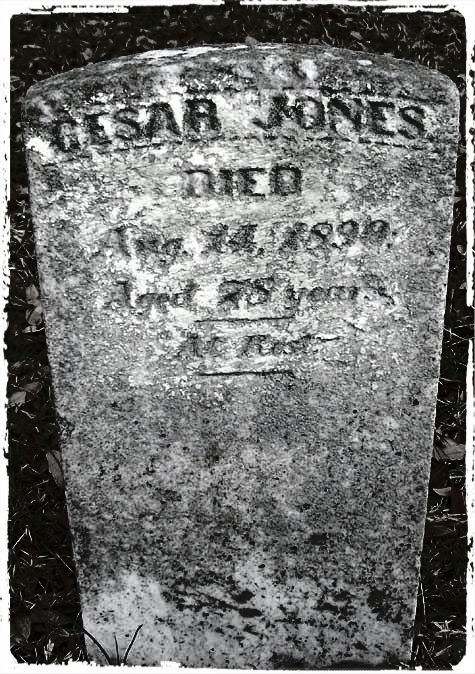 His name was Cesar Jones and he was my 3rd great grandfather. This is what I know of his life. From the 1880 Federal Census it was noted that he was born in Onslow County, North Carolina sometime around 1814. According to his son Alexander Hamilton Jones's death certificate he was born in Swansboro. I believe he was a slave of one of the wealthy Jones families, of that county prior to the Civil War. Ancestry.com and The Church of Jesus Christ of Latter-day Saints. 1880 United States Federal Census [database on-line]. Provo, UT, USA: Ancestry.com Operations Inc, 2010. 1880 U.S. He and his wife Mary H. Mitchel Jones had at least 6 children together. A number of the descendants of Cesar and Mary Jones went on to become medical professionals. On my branch of the tree, a daughter of my 2x great grandfather Alexander Hamilton Jones, a Mrs. Lovie Jones Watson went on to become a registered nurse. Three of the sons of William Henry Jones were dentists (Oscar Dunn Jones, Caeser N. Jones and James Edward Jones) and another was a promising medical student before he died (William Thomas Jones.) I wonder if the seed for this was planted by my 3x great grandfather. Did he stress the importance of education with his children and then successive generations passed it on from there?